This set of eight detailed images from the Victorian period and the 1920s to 1950s shows children's toys and games and ideal for use at Key Stage 1 and 2. 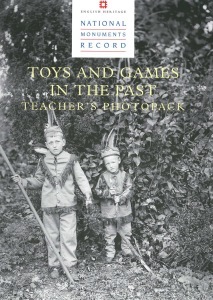 Taken from the National Monuments Record, the pictures include Victorian nursery, children playing leapfrog and a 1920s' toyshop. Background information and suggestions are given in an eight page pamphlet for further discussion on the subject.